Nights spent with good friends and fun adventures make for lasting memories. Venture to the casinos around the state for fun, entertainment, delicious dining experiences and much more. A trip to Mardi Gras Casino and Resort can cure any case of the winter blues with its nonstop action and entertainment. The casino features 30 table games including favorites like roulette, craps and big six. It also has 1,000 slots to keep you entertained all night. Sit down for dinner at the French Quarter Restaurant and bar for delicious steaks, seafood, cocktails, wine and champagne. Or head to Louie’s for great entertainment such as Motown, oldies, jazz, country, comedy and more. Throughout the year, Mardi Gras Casino and Resort runs incredible promotions like Treasure Chest Mondays and Winning Wednesdays, which makes your visit even more special. There’s never a dull moment at Wheeling Island thanks to more than 1,000 slot machines, blackjack, roulette, poker, entertainment and much more. This winter they have a special package you won’t want to miss out on. The “Winter Hotel Package” includes a deluxe king bed room or a two queen-bedded room, $5 free play per guest per night and $10 food credit per room per night. This package is the perfect way to experience and enjoy all that Wheeling Island has to offer. 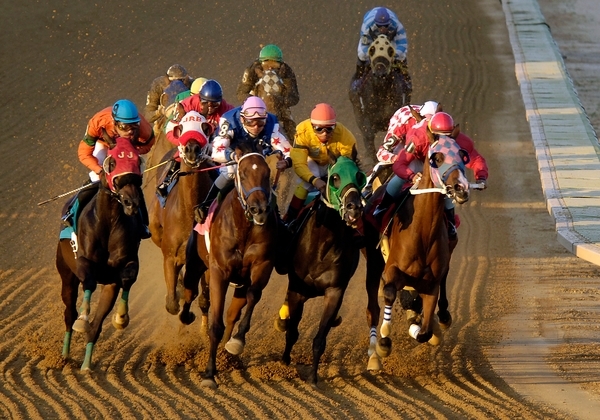 Enjoy a luxurious weekend getaway at Hollywood Casino at Charles Town Races. Here, they have more than 2,000 slot machines, 75 table games, live thoroughbred horse racing, six restaurant options and incredible shows year-round. Upcoming shows include Jay Leno, Joan Jett and the Blackhearts, and Trace Adkins. Both the Final Cut Steakhouse and 9 Dragons are award-winning restaurants. Keep your eye out throughout the year for fun giveaways and promotions special to Hollywood Casino, and you may just win a special prize or giveaway. If you’re looking for a fun time, look no further than Mountaineer Casino, Racetrack and Resort. It’s a great place for an action-packed night with your friends. Book a suite for the weekend and enjoy all the luxuries the resort has to offer. Head to the casino for over 1,500 slot machines, poker, Texas hold’em, Spanish 21, Let it Ride and many more table games. Enjoy dinner at LBV Steak and Pasta, and afterward, take in an incredible show you’ll never forget. The Casino Club at The Greenbrier is a Monte Carlo-style casino that combines high-roller thrills a and high-class style. Enjoy 37 table games and more than 300 slot machines. If all that playing makes you work up an appetite, In-Fusion is located in the heart of the Casino Club and features modern Asian cuisine, a fresh sushi bar and a sampling of Pacific Rim dishes. The Greenbrier currently offers a Wintertime Package for $699, two-night or $999 three-night stay. This package includes early check in and late check out, $200 (two-night) or $300 (three-night) resort spending credit, breakfast in the Main Dining Room, admission to live musical events and family entertainment, four-hour Adventure Zone experience for children ages 3-12, and one-hour shuttle to Winterplace Ski Resort.